The speaker describes her upbringing. She left school to work in Woolworths’ before moving to the Tick Tock factory (c.1958), where she earned ‘a lot of money’. She left when she became pregnant (c.1965). When the children were small she started at the Economics making drums for the Mond Works (c.1970-1). This was dirty work in noisy, poor conditions. She moved to Berlei’s to work in the canteen (c. 1971-81) and became the manageress. She describes buying bras for sixpence, timing toilet breaks, ‘top payers’, unionism, music, a trip with the Merthyr factory on the train to London. When the factory closed she went back to Tick Tock (Rover works) (1983-99). She became a supervisor and got her cap and gown for business management. 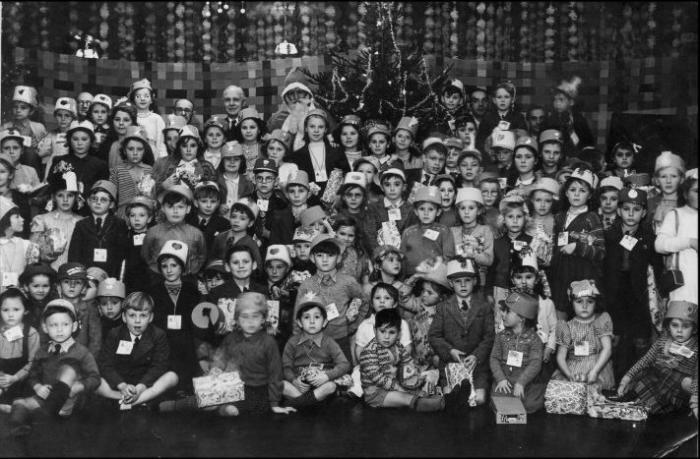 Joyce left school at 15 (1947) and started at Tick Tock (1947-1962) – then 9 years ‘out’ with the children and returned for 17 years (1971-88). It was difficult to get in there – you had to pull strings. Making coils for aeroplanes. When they started making watches she went on inspection on the Anglo site - a beautiful dust-proof building. In the beginning she was too frightened to go to the toilet. The boys in the automatic department used to whistle. In the dust-proof area – special rubber shoes and overalls. Making c.3000 watches a day (setting them by hand), and on to a further 7 regulation racks before ready. She was also a floater. When the Enfield clock factory opened she trained for the swing shift (4.30-9.30), mainly married women –friction with day shift, because they were hitting targets. Marriages announced in Tick Tock magazine. Her husband was a shop steward with AEU. Strict rules – Personnel Officer. Back injury – because of factory? When she got married in 1951 her colleagues gave her an Enfield clock. Dancing classes, dances and trips. The new young workers (1980s) had no respect and used bad language. 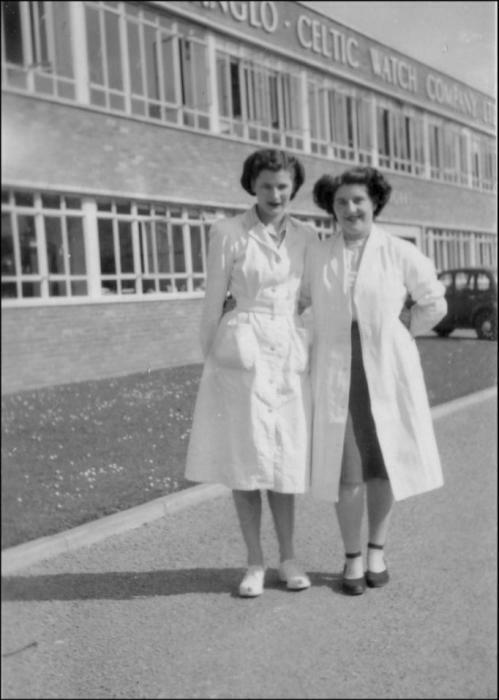 Rosalind left school at 15 (1958) and soon went to the Anglomac Factory, which made raincoats. She was in the cutting room – until 18 she could only lay out the fabrics. All the cutters were women. The factory closed (after c.1 year) and she went to the shoe factory. Believes there was a stigma with being a factory girl. The cutting knife could be dangerous. Perks – buying raincoats and got cottons. In New Stylo she decorated the shoes, using a stapling machine attaching trims. Stayed a year again. Bigger factory wirh more facilities. Later when she had children she worked in Revlon (c. 1969) on 10-2 shift – mothers’ shift. Very fast and boring jobs there. One job putting a top on a bottle and hitting it with a mallet. Nonstop so had to be replaced if she wanted to go to the toilet. Some of older women talked a lot about sexual things. She worked intermittently there for a period. Ann left school at 15 (1961) (suffered with rheumatoid) and worked in Woolworth’s, before having a daughter and trying for work at Attwood’s. Offered a job as a solderer. A year’s training. They made jewellery. Details of job. Hundreds of designs- making the Welsh feathers. Plating room. Making Lady Diana earrings, Elizabeth Taylor and Pink Panther necklaces. Different processes Miner’s strike 1970s – power cut to factory and chaos. Having to work nights to make up orders and get wages. Union didn’t help her. She enjoyed training others. Working with lead – white blisters on hand – undiluted flux. Also asbestos – suddenly ripped out. Degreaser machine – let out fumes. No masks. Overalls with A&S on them. Rheumatoid arthritis while there – hospital - had to leave. Some supervisors bullied to leave. She worked here for 27 years (1969-97) She also did second jobs (in cafes and clubs) when in factory to support her daughter. Records and singing. Describes different jewellery – Concorde necklaces; tiaras; crystals from Swarovski. Bosses paid for Xmas party- box of chocolates each. Raffling jewellery. Worked on a variety of processes – soldering was a creative, skilled job. Dilys worked in Woolworths after leaving school for four years. She moved to Ferranti's, around 1961-1962, where she stayed for six months, before leaving to work at Austin Taylor. Almost straight away, she became one of their 'keyworkers' learning how to treat people and train them on the product. She remembers that one girl got her hair caught in one of the machines once and she had the wit to turn it off.They had to get scissors and cut some of her hair to get it free. After eight years, she became ill with appenicitis and had to leave. The factory told her that if she wanted her job back she'd have to go to a tribunal and, with no union to back her up, she lost her job in 1970. Sandra went into the plastics factory straight from school, in 1970, making watering cans and sun visors. They were doing time and motion, everyone had their targets, and wages depended on how many sunvisors a worker had made, so people were going full pelt in order to earn a high wage at the end of the week. After two years, she moved to Austin Taylor in Bethesda, where she was able to walk to work. The factory made electronic parts and she was on the machines, in the machine shop, and she said the machines were so big, you wanted to run straight back out again. But the men trained her and in a day or two she became 'a real boy' on the machine and very happy. The workers had targets to reach in this factory too and sometimes did a 56 hour week to reach them. Later Sandra became a supervisor. She stayed in this factory until it was about to close in 1998, when she left and started her own business, supplying chickens to butchers shops around Wales. Doreen left school at 15 (1955) and worked in Littlewood’s café before going to Avana’s (1958)She put nuts on Dundee cakes first – wore overalls and turbans. Changed jobs, but difficult to keep up with conveyor belt! Saturdays she wore rollers under the turban – told to take them off. Ringleader for mischief. Talks about the foreign workers in the factory. Singing to radio. Cakes for M&S. Dancing and roller-skating in Cardiff. Pranks: dared to go down belt to loading bay; tying shoe laces. The men worked the ovens. Made 21st birthday party for her. Cakes half price. Left to get married 1961. Stayed 2 months at the Lyonite Factory, Canton making music boxes, but smell of glue. Back to Avana for 2 years. Worked a few months in laundries and then in Freeman’s.c. 1965-6.Working on hopper . She put the top leaf on the cigar then. Then pregnant and left (1968)If late lost her machine. In documentary about training in cigar factory. Afterwards she worked in a restaurant for 21 years. In Elke’s Biscuits for c. 8 months between Avana and Freeman’s. She tried to lead strike in Elke’s because of heat. In Avana someone lost a finger in the machine- put it back on. Enjoyed in the factories. Beryl began working in Hodges in 1960/1 (until 1964) after leaving school at 15. She knocked on the door of the first factory she came to. They made men’s suits: men cut the material out and the girls sewed. She worked in the cutting room. She notes the importance of unionism in both factories, giving her mother her pay packet; the Swansea girls; the monkey parade. After marrying and bringing up the children she worked in Avon Inflatables from 1980 making dinghies. She describes the smell of glue and a complaint because she spoke Welsh. You learn about life in a factory. She left in 1990. Nancy went down to the toy factory on leaving school to ask for a job, as you were expected to work. She didn't really like it “but it was a job and you had to take it. Some parts of it I liked and some I didn't.” She did like “doing my easels, yes, I used to like doing that.” But she says she got bored with the routine, the same thing all the time. She mainly did the easels and blackboards, knocking the nails in and sanding down the wood, and also using staple guns, which used to 'jump.' The toys were good quality and a well-known brand, Bacon's they knew it as, but it might have been Valley Toys. There were no perks, if there was a reject they couldn't take it “no way, could you heck, no.” There was no bonus at Christmas “we didn't even know what that was.” The factory was very basic but she enjoyed the camaraderie there. She left the factory at 17 and got married shortly after. She did return to work afterwards but never did factory work again. Margaret's first job was in the kitchen in the school canteen, washing up and helping with the dinners, for which she thinks she earned the equivalent of 50p. She was there for about two years. She went to the toy factory in 1948 after going down to the factory in person to ask for job. She must have had an interview but can't remember. She was happy to have a job because you had to have a job in those days, she said. She thinks she worked from 8am to 5pm, but didn't have to work weekends. They had breaks but there was no canteen. The workers went to MacLean's Cafe in a street nearby where they bought their teas and coffees and something to eat. She worked in the toy factory for ten years between 1948-1958. 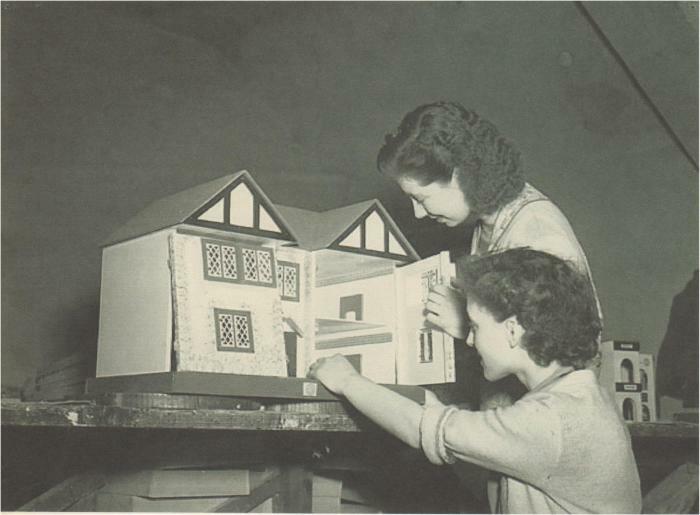 She says it was a friendly place to work and she built the dolls houses the whole time she was there. There was no messing about, you had to concentrate on the job, she said. The owner, Mr Bacon, was always there, in and out of the office. In the end, she left for a job that offered better wages.